It’s another card for the Hope You Can Cling To Challenges over at Splitcoast. In case you missed it…all my cards are headed to Houston to the MD Anderson Cancer Center. This is an annual card drive that so many stampers contribute to. Have some spare cards? Just click on the link in the upper right column for all the info. Cindy has asked us to make birthday cards today and she provided some very pretty photos for inspiration. I honed in on the flowers and the pink/white colors. The card base has been dry embossed and then layered with some rose and grey/black striped designer paper. 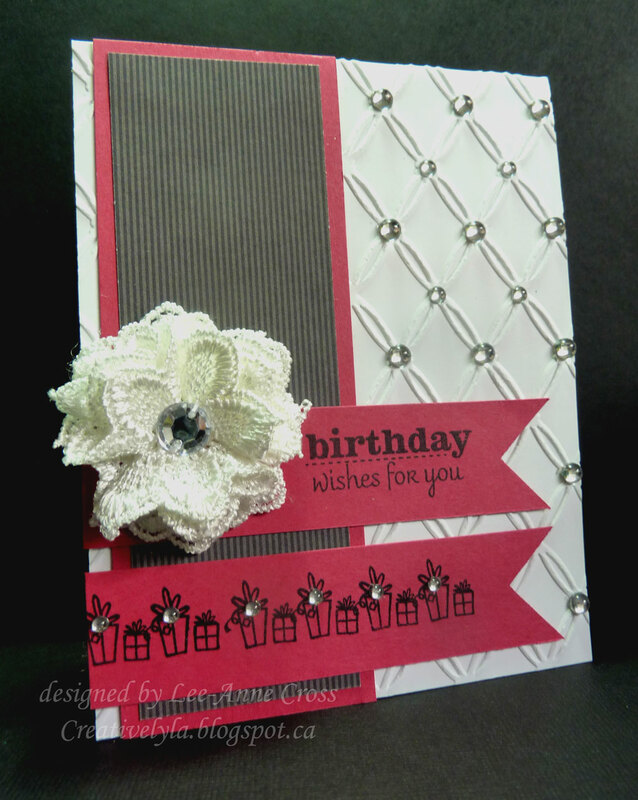 I added some rhinestones down the right side of the card…alternating medium and larger stones. One of the banners was stamped with the sentiment and the other with a row of birthday presents that have even more bling on them. Then, I added the Maya Road flower with a rhinestone center. Back soon with more my friends! Hope you’re having a wonderful day!